"Speed vs. 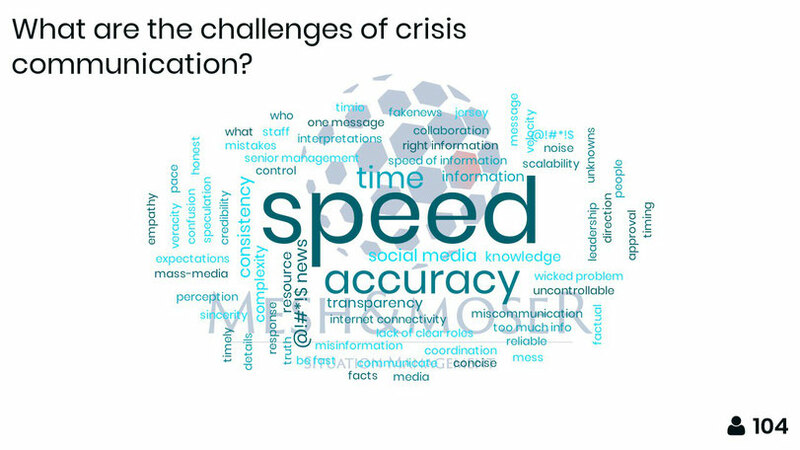 Accuracy" Or "Why Informing and Messaging is not the Same"
Talking about current and future challenges of crisis communication recently at Crisis Conference 2018, I asked the participants to give me one word representing the biggest challenge they face. I was not surprised to see how the cloud impressively confirmed the point I wanted to make: The major conflict communicators have to manage in the early stages of a crisis is the demand for almost instant communication vs. the lack of confirmed information. It has always been tricky to get response organisations up and running to meet the demands of journalists and the press. But since the Golden Hour has become the Golden Moment with the rise of social media, this challenge has grown to be the predominant issue when it comes to effective crisis communication. At least since Capt. Sully Sullenberger’s legendary ditching and the iconic Twitter picture of the US Airways’ Airbus in the Hudson River that made it front page worldwide (the next day), we all know that it isn't traditional media any more but social media that break the news right when it happens. We internalized the sacrosanct principle of never speculating, only to publish confirmed information. But to get this information from your operations department, from first responders on the ground, from forensics or authorities will take some time. So what now? Wait until all details are on the table? No. In the early stages of a crisis the most important thing is to ensure the public that you are aware of the issue and that you are prepared to take action. It is a about messaging. It is about sending the message that you are in control and that you are taking action. It is about assuring your stakeholders that you know about your responsibility. No one expects that you know everything already. A holding statement saying that you are aware of reports that something is going on, that you have taken proper action and that you will come back with confirmed information as it becomes available will not buy you a day, but it will give you the time you need to get your facts straight. However, it is essential that you keep this promise and provide that information once you confirmed it is correct. With this your messages will be complemented and supported by the information you publish. This may sound simple and it truly is. But you won’t believe how often this simple principle is forgotten once the alarm bells ring and the instant social media surge causes panic. All of a sudden leaders don't trust their own arrangements anymore. This is why it is so important to not only have these procedures and a template of your holding statement stored in the drawer. It is essential to teach your staff about the differences between messaging and informing and to regularly exercise these situations. With this, you will minimize the paralysis in the first moments and gain the time to establish yourself as a credible source of information - because without credibility the battle will be lost.